We’ve been thrilled with the response that Localscope has been getting from iOS users across the world, since its release. From being recommended as one of the apps that brings a difference in the App Store trends, to the Ultimate Find & Drive combo, Localscope has been getting appraisals from experts and users alike. Localscope - is such a beautiful #iPhone #app that I don't think I will ever use google mobile app or other search apps again. We’ve learnt a lot from our customer’s suggestions and feature requests, and are committed to implementing these as features in Localscope. One such feature request is being made available immediately with the latest version update of Localscope. With this new update, Localscope integrates with the leading provider of location and navigation solutions - TomTom - enabling users to get turn-by-turn voice directions to the destinations they discover using Localscope. Localscope users love its simplicity and the ability to find new locations in their area or any new place they visit. With this new integration, we extend the power of choice to our users - not only can they decide the search engines they want to use to discover new places but also choose their favorite navigation app to get them there. Both these actions, slide up the options to start navigation to a destination using either TomTom or the Maps App or Navigon MobileNavigator. Tap on your favorite navigation application to immediately initiate a turn-by-turn voice based (except Maps app) navigation to your place of interest. 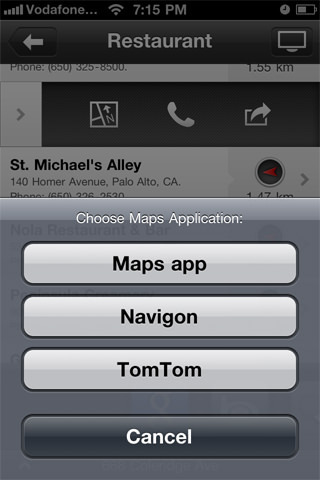 Besides the integration with TomTom, we’ve enabled seamless sharing with the Facebook App for the iPhone. Being one of the first integrations of its type, it allows users to directly share locations from Localscope via the Facebook app on their device, without having to log in every time. You only need to authenticate the first time you are posting on Facebook with Localscope. Then you can edit the status update that you are wanting to post. Localscope already integrates with the Twitter app for the iOS devices. The link of the location is automatically shortened in your message for both Facebook and Twitter. If you like Localscope, don’t forget to rate and review it in the AppStore. While we’re working on bigger ideas and releases for Localscope, the next update is already in the pipeline. Since there’s still some time until the big release, so we can’t reveal any specific details, yet. Rest assured though, we will continue to add new features you will all love. Stay subscribed on our Facebook page to be in the know.